The more we thought about creek paddling, the more Bryan and I thought we should get Crash a helmet with more face protection. She's never had the least little problem with wearing helmets, and agreed that she'd appreciate headgear that might help her keep all her teeth and jawbones in the same place. We asked around and did a little research, and just when we'd decided on a ShredReady, and Bryan found one on sale. The new helmet arrived on our doorstep right beside a nice big rainstorm that brought the creeks up. But Mandy’s grades weren’t great, and we wouldn't let her skip school. 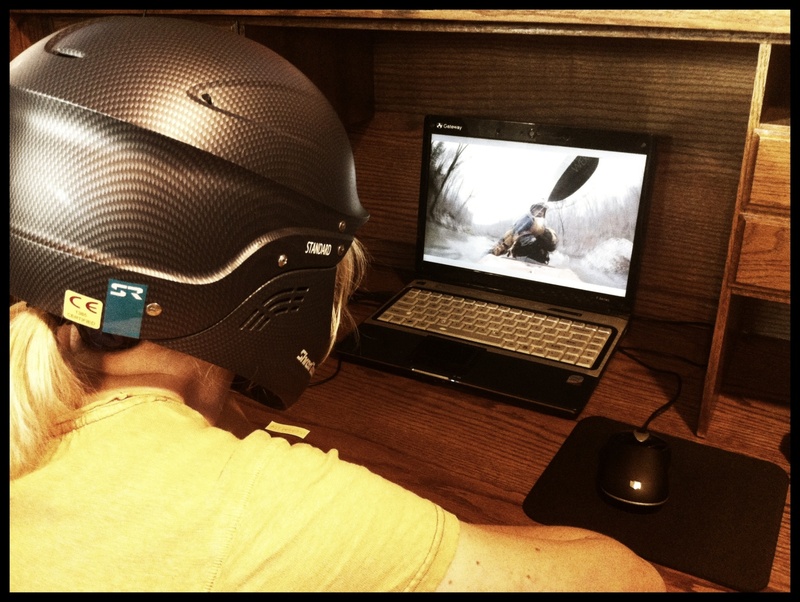 She was stuck at home, wearing her new helmet in the kitchen, watching videos, while her friends paddled Richland Creek. And then it was Mardi Gras time. I love Mardi Gras, but for Bryan's family it's mostly an irritation and an inconvenience. This year they decided to escape the busy week in New Orleans, and drove up to visit with us instead. 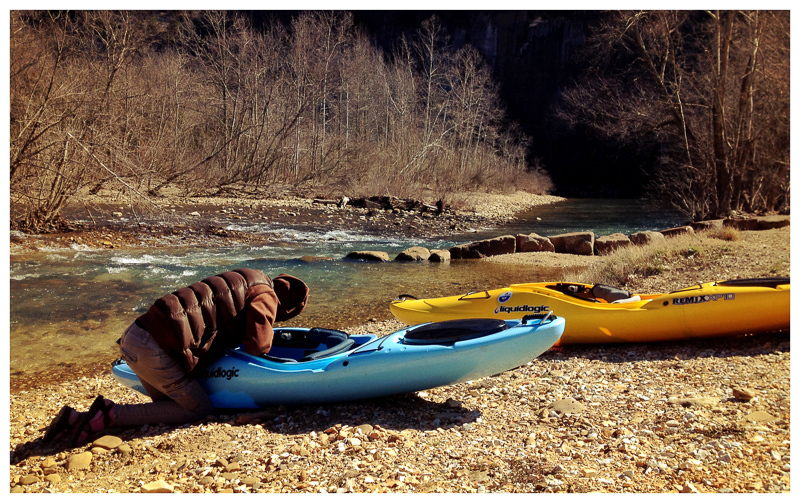 While they were here, Bryan and Mandy took them to paddle on the Little Maumelle River near Pinnacle Mountain. Jarion and Kathy went along too, and so did Mitch and Monkey. They somehow managed to arrive at the put-in with ten boats and nine people, but apart from that the day went smoothly. It was a whole flotilla of bright plastic boats, on a chilly rainy afternoon in February. More rain the following week brought our Arkansas rivers up a bit, including the Cadron, north of Conway. Several of us got together to float a short section of the creek together. It was our family's first trip and we all agreed that the creek was much prettier than we'd thought it would be. For me, the high point of the day was sliding my boat down a steep mud bank into the water. I'd have done it a dozen times if I could have. I was pleased that I stayed warm-side-up when I hit the water in my kayak; Chris landed upside down in his canoe but rolled it neatly back upright. On the way home from Conway that night, the drive shaft in our friend Heather’s car broke. We were following her on the interstate, so we stopped to help. It was a bad night for Heather, but it worked out well for Mandy and Bryan. We waited for two hours for the tow truck, and then followed it to the Subaru dealership, and then took Heather home, and by that time we'd set up a Buffalo River trip for the next day. There was a sleepy dash to hang wet gear up before bedtime. And we got up on Sunday morning to load the car for another trip. I stayed home to study for a test, but Bryan and Mandy had a good time on the river. 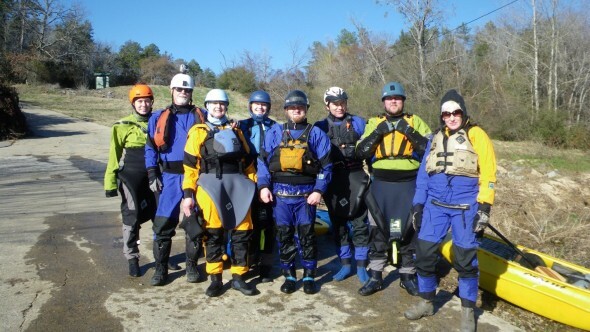 A well timed rain brought the Cossatot River to a perfect level for beginners on a Saturday near the end of February. The day was fairly warm and almost sunny, and I think every whitewater paddler in Arkansas turned up at the river. 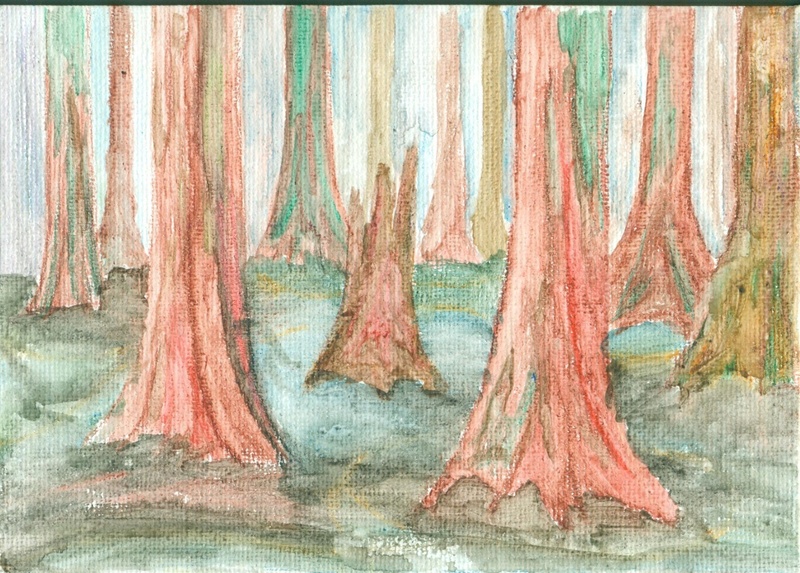 Mandy wrote about the day in an article for Arkansas Outside. You can click HERE to read her story. I couldn't help but notice that Mandy didn't say much about herself in her article. She’s really getting to be a good paddler. In between trips, she’s watching videos and reading books and drawing pictures and just THINKING a lot about kayaking. On the river, she learns from watching and following her friend/teacher Cowper. The child has always loved water. And that over-ability to focus she’s always had – the thing that caused her such problems in school and at suppertime when she was little – is working for her on the river. It’s great to watch her concentrate on moving with the current around her. She looks comfortable on the water, whether it's still or rushing past or dropping off a ledge into foam. She looks happy. And Bryan and I are having a pretty good time, too.